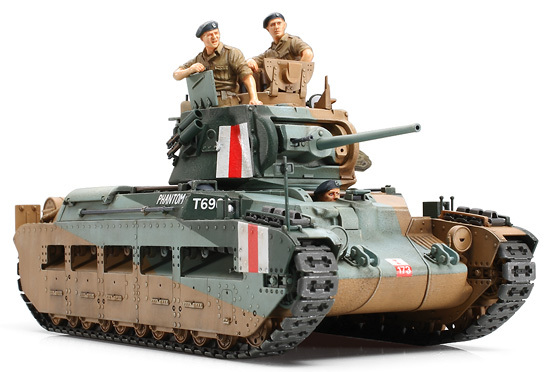 【 “Queen of the Desert” 】　The Matilda was developed as a heavily armored infantry tank and was the British Army's main tank in North Africa during WWII. The Matilda swept aside Italian opponents and was respectfully called the “Queen of the Desert” by German forces. During Operation Battle-axe to lift the siege of Tobruk in June 1941, German forces famously used their 88mm AA guns in the anti-tank role as they were the only effective counter against Matildas. The Matilda has written her name into the history books as a highly effective tank which continually proved her worth during many fierce battles throughout North Africa. 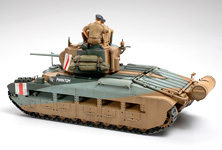 【 About the Model 】　This is a 1/35 scale plastic assembly kit of the Matilda Mk.III/IV. ★Length: 174mm, Width: 72mm. 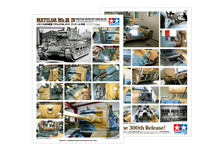 The Matilda's form has been richly reproduced based on a detailed study of the actual tank. 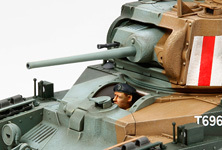 ★The turret, gun mantlet, and front hull feature a realistic cast metal texture. ★The mechanically complicated suspension also has a detailed finish. ★Belt and assembly type tracks included. ★3 types of North African markings included. ★1 full body commander, 2 torso (loader and driver) figures included. The Matilda's dynamic form has been realistically reproduced. The engine inspection hatch also has a rich finish. 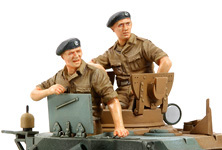 The commander sitting on the cupola and the loader putting his hand on the hatch enhance the realism. Torso driver figure is also included. 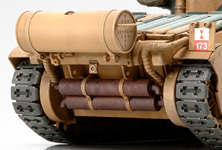 The gun mantlet and the front hull feature a realistic cast metal texture. 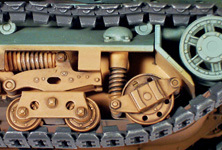 Assembly type tracks seen from side armored skirts feature a realistic sag effect which enhances the model's presence. Insulated exhaust pipes and the way they are connected to the exhaust is another great feature. Special photo leaflets are included with the first edition lot. These color photos of the actual Matilda will definitely motivate your modeling.